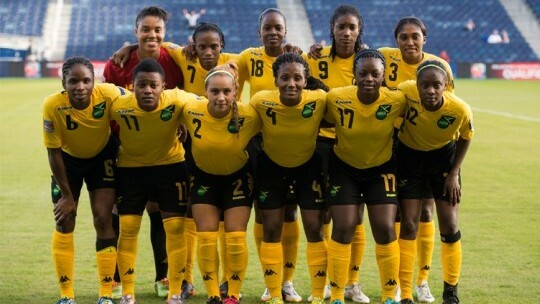 Jamaica’s senior women’s football team will kick off the nation’s hunt for medals against Venezuela, at the Central American and Caribbean (CAC) Games in Barranquilla today, beginning at 10:00 a.m. The Senior Reggae Girlz arrived on Monday and the team’s head coach, Lorne Donaldson, rates their chances against the Venezuelans. Jamaica will play matches a day apart in its first round grouping, facing Costa Rica and hosts Colombia in respective fixtures on Saturday and Monday. The top two will advance from the group and Donaldson, while referencing regional superpowers Mexico, expressed the hope that the Girlz will qualify for the other phase. The team will be missing several key players, notably goalkeeper Sydney Snyder, who picked up an injury just days ahead of the competition. “We had a big setback the day before we left; Sidney Snyder went down, a top notch goalkeeper, so we had to fly another goalkeeper in and I think that kind of put less confidence in the players because the way she plays she complements all the players very well,” Donaldson observed. “But I have good faith in all the keepers; Chris Ann (Chambers) played when we were in Haiti and she was very good, so we’ve a lot of confidence in Chris-Ann,” he added of her replacement. At the other end of the pitch, Khadija Shaw will lead the team’s offense, in tandem with Sashawna Campbell and Ashley Shim, with Jody Brown in close quarters. The match will be followed later in the day by the opening ceremony at the Estadio Metropolitano Roberto Melendez, where all the competing countries will be gathered. Participating under the theme, ‘Generation Next – the Future is now’, Jamaica has sent its largest ever contingent of 185 athletes to the Games. The previous record number of athletes to have represented Jamaica was 135 and Ryan Foster, CEO of the Jamaica Olympic Association (JOA), the country’s umbrella sporting organisation, underlined the significance of strength in numbers and the opening it provides for Jamaica’s ‘next generation’ of sporting stars. “The future is now for the JOA and the CAC Games will not only showcase our current top performers in the respective sporting disciplines, but will also have the next generation of athletes who will be taking up the mantle for years to come,” stated Foster. Among the top stars are swimmer Alia Atkinson and track and field’s Olympic relay gold medallist, Sherone Simpson, both of whom are the joint captains of the women’s team. Over 470 events will provide competition at the Games and Jamaica will also increase its participation in the varying disciplines, with representation in 17 different sports as opposed to 14 at the previous Games, which was held in Mexico. At that championship, Jamaica competed in track and field, football, badminton, basketball, cycling, fencing, hockey, rugby, squash, table tennis, tae kwon do, triathlon, tennis and beach volleyball. This time, Jamaica has qualified athletes for other sporting disciplines such as swimming, water polo, wrestling, shooting and karate.